It seems to me, now that I am a veteran of big winds, that the Philippines could benefit greatly by introducing a new model for responding to natural disasters. Such a new model would ideally adopt two changes in how disasters are handled. One, it would impose a military-style perspective and commitment that “this is war” in order to end the disarray caused by overlapping government entities engaged in fighting battles of ego. Two, it would adopt an understanding that true rehabilitation is a matter of economic recovery, not relief. The instrument I propose be used to drive the recovery phase of the new model is “The Lifeline Services Act”. It places a primary leadership responsibility on large corporations. But first, let’s deal with the needed adjustment of attitude and commitment. Philippine society is predominantly a reactive society. Pre-planning and preparatory work are weak. The nation responds to events rather than shapes them. It is a transactional society that goes from deed to deed rather than applying principles and concepts. And it is an ego-bound society where every government leader takes offense if another government entity steps into his territory. I personally believe that military discipline and life-or-death execution provide the kind of thoughtful, determined approach that could dramatically change how the Philippines prepares for and responds to natural disasters. Why? Because military units in battle are driven to succeed. And leaders are ordered to follow a chain of command. That is not now the method in the Philippines where too many arguments and blames ensue and too many fat-cats rest in comfort as others fight. This is a nation at war. If anyone doubts the truth of this, I’d suggest he drive the road from Tacloban to Ormoc in Leyte Province. That is about three hours of endless destruction and tragedy. It is simply jaw-dropping. Piles of rubble that used to be homes, empty-eyed buildings that used to be schools, shattered glass, shredded tin, huge trees split or ripped from their roots, hollow-blocks in endless piles alongside the road. Utility poles and wires scattered across the landscape like so many matchsticks, so much string, tossed about by God in an apparent fury against our manly transgressions. I argued for a military mindset in those articles, prior to Typhoon Yolanda. And now I am absolutely convinced that this kind of purposeful, determined focus is necessary, both in preparation and recovery. Today the Philippines defends herself like an old lady with a walking stick and too much rum on her breath. She recovers like an alcoholic who can’t seem to get a grip on what it takes to have the discipline needed to think and act straight. She is an old crab more interested in bickering than solving problems. In a military organization, cities and municipalities in calamity areas would report to provinces and provinces to the national government. Subordinate to superior. No overlapping disaster committees trying to coordinate egos. Command. And Control. Having seen the generally slow and sloppy response to Typhoon Yolanda, I am also convinced that the proper top priority after natural calamity is economic recovery, not relief. 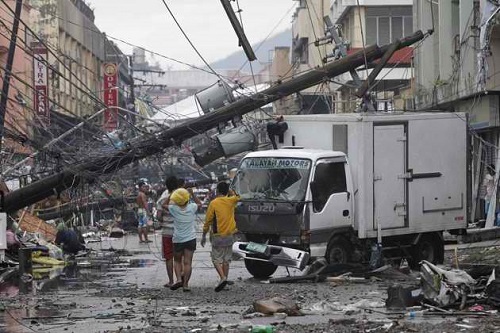 As the Red Cross has cautioned, the Philippines needs to take care not to become a nation dependent on relief agencies. To the cynic – and there are a lot of them after this storm – relief suggests the nation is populated by impotent beggars who need the gifts of government to get back on their feet. This attitude denies the two great strengths of Filipinos far and wide: resilience and a willingness to work hard. Face it bluntly. Recovery is not aided much by three kilos of rice pawned off on a hungry public by a preening, epal-addicted politician posturing for a sensationalist press. After a super-typhoon, three kilos of rice is a tiny spit of solution in a huge ocean of need. For sure, the aid packages are vitally important to the impoverished. The poor would welcome the packages any day, not just after disaster. But these aid packages do little to get to the real recovery that is needed, and would make the hand-out of relief goods unnecessary. Desperation is characterized by the absence of a way to sustain life, and the taking of goods by force. It is characterized by a building sense of panic and rising crime. Tacloban City knows desperation. Insecurity thrives in an unstable economic setting. Hope is characterized by a quick rebuilding of markets that functions properly, with trade and jobs and goods and money doing their work. There is security in that. Biliran is a small island province north of Leyte. The municipality of Naval is the main center for commerce. Biliran serves as a useful case study because it is isolated and, although incurring considerable damage from Yolanda, was not thrown into the state of massive destruction, loss of life and desperation that occurred in nearby Tacloban City. Biliran was on the edge, hanging delicately between desperation and hope . . . day after day. The effort to recover was hindered – not helped – by six large corporations whose executives were not driven by a sense that it is their obligation to lead recovery. These companies played it safe. They followed. They withheld vital resources from Biliran that would have enabled hope to win easily. Most people think that electricity is what powers recovery. That is wrong. Electricity is nice, but not essential. Generators are everywhere. Fuel, for transportation of goods and people, and to power generators. Communication, to allow commerce to take place and establish a way for cash to get quickly into the damaged markets (functioning money transfer services). Cash, to facilitate trade and rebuilding. Goods can get to the market if there is a way to pay for them. In the case of Biliran, the main highway was re-opened the day after the storm and the dock at Naval was also open. Yet critical gasoline and cash were not delivered by major corporations for a full week after the storm. Communication with the rest of the nation was cut off for a full week. Broadband internet services, so vital in the modern world, have yet to be re-established, six weeks later. What is the reality of this in a damaged, isolated community? No communication? Isolation generates a bed for insecurity and worry. No cash? Extreme need and rising panic build. What a difference a day makes after catastrophe. Each day is one act of a play, and the performance in Biliran simply ran too long. It took Petron and Shell seven days to get a truck to refuelling stations in Naval, the main municipality on Biliran Island. Rationing lasted another seven days. Normal service resumed on day 14. It took Globe seven days to re-establish cellular service. Smart offered no service for 23 days due to a damaged transmission tower in Samar. Neither company provides broadband internet services as of this posting. It took Land Bank and Metrobank 10 days to start providing cash to customers. Hours were shortened and withdrawals took two days to complete because branches did not have lists of customer account balances. The two companies that did help were Philippine National Bank (PNB) and Star Oil. PNB started issuing cash to passbook customers on day 4, and all customers on day 10. Star Oil ignored price restraint laws, tripled the price of fuel, limited amounts to 5 liters, and pumped its tanks dry in about 4 days. No one complained about that, or about gas shipped in mysteriously from neighboring Maripipi Island at P200 per liter. It was the only fuel available and it kept a small measure of commerce – and hope – in place until Petron finally delivered a truck to market. Corporations are not chartered to provide public service. In a disaster, they are naturally drawn to caution and, of course, the profit that comes by avoiding loss (e.g., hijacked gasoline trucks). But in a calamity, this caution hurts the recovery tremendously. It allows desperation to build. It prevents natural markets from getting re-established. In Naval, it encouraged hordes of people to flee to Cebu and Manila. It is important to impel large corporations that provide vital lifeline services to act with urgency after a natural disaster. Fuel, communication and cash allow markets to work. It is important to mandate that corporations lead recovery. Not follow. These resources are crucial and every day counts. General Patton’s tanks would have been slaughtered without fuel, communication and ammo. Economic recovery is dead in the water without vital lifeline services. That is why legislation is required. Without it, desperation will win too often. The Lifeline Services Act” should be dedicated to the thousands who lost their lives and the hundreds of thousands who suffered substantial harm from Typhoon Yolanda. The law should mandate that critical lifeline services be resumed within three days after a natural disaster ends. Failure to comply should result in automatic fines against the corporations that operate in calamity markets. Companies will object, and may have legitimate reasons for non-compliance in some instances, but the burden of explaining why they could not respond in a timely way should fall to those corporations, not public officials. Until corporations accept that they have a vital public service role to play, they will throw up every argument as to why they cannot comply with the “three-day” mandate. It would be unwise to let them off the hook easily. Hearings on non-compliance should be gruelling for corporate executives of companies that fail to provide services, to explain why they displayed so little initiative or innovation or will. For the oil companies that say that roads are out or it is too risky to risk hijacking, the response is to think militarily. Put trucks in secure convoys or ship them in by boat. Figure out a way. Don’t sit back in cautious, complacent comfort while Philippine citizens are bleeding on the front lines for want of gasoline. Think how to do it. Not why it is easier not to. To banks that say we can’t get cash safely in and don’t have proper records in-branch, the response is to establish a joint disaster recovery unit among all banks and buy a helicopter or two. Fly in cash and a secure print-out of customer balances. Fly out manual transaction records for update of customer records at a functioning branch, and a reprint of balances for the next trip. See the urgency. Live it. Solve the problem. This draft is a starting point, a discussion paper, really. It starts to brainstorm some concepts and some particulars. THEREBY preventing the rise of a sense of desperation that fuels looting and destruction at the hands of people in need, and assuring that local markets return quickly to good health, that being to the advantage of those corporations. Available cash withdrawals from bank deposit accounts. Minimum hours of operation shall be from 6:00 am to 8:00 pm. The penalty for non-compliance shall be P100,000 per day per type of fuel that is not available. If fuel is provided but rationed, the penalty shall be P50,000 per day per type of fuel that is rationed. Fines shall be levied by the city or municipality in which stations operate, with appeals directed to an appropriate unit of the Department of Interior and Local Governments (DILG). The penalty period shall last 45 days. Large corporations need to do more to get local markets back on their feet after a natural disaster. It is that simple. They need to work with a military sense of urgency to lead recovery. If they need a cane to the back to become properly motivated, apply the cane. I agree, we should hold these greedy corporation accountable for their lack of social responsibility. What are corporations without the protection of government? A government formed by the people to serve the people! Someone with courage needs to stand up to these greedy corporations. I think Mar Roxas would be the perfect person to hold them accountable for turning their back on the people. If Mar Roxas can hold Romualdez accountable for his failures, he can surely do the same to these powerful corporations. Mar Roxas — a true fearless servant of the people! I hope Noynoy dispatches him to set them all straight! I look forward to exploring the pros and cons of Mar Roxas as presidential material. I know many agree with you and a bunch do not. I’ve stated skepticism, but admit it is a shallow reading. There is no question he has worked hard for a strong Philippines. Joe, I’m very, very happy that you’re back!!!! And it is good to be back amongst friends, Mel. Thanks. Great suggestion Joe! Unfortunately, I hate to say that unless the majority of the Philippine electorate matures up and elect the right people who will enact appropriate and just laws and who will execute it religiously and equitably, nothing much is going to change. I’m now in my twilight years and from the time I became old and conscious enough to understand what was going on in my country of birth, the only change I have seen is from bad to worst. From the mid-60s to this day, the deteriorating trend has been downhill. Politics and governance are but a small portion of the problem. It is society, the greater number of the people themselves who need to change if any real improvement is to be had. Yes, it is true that there is still ‘goodness’ around; a few good and well meaning people. However, in a democracy, the voice of the minority is normally muted by a mob-like majority. There are days I would wonder, perhaps what the Philippines need for the moment is a dictatorship. Hopefully a benevolent dictator who will manage the Philippines following the lines of your “Lifeline Service” concept; after all the Philippines needs to recover as a nation from the rut that it is in NOW. More power to you Joe! Wow, some good issues here. The one that intrigues me is the decline in respect for the elderly. It seems to have been replaced with a kind of servility to the powerful. The “D” word (dictator) pops into my mind now and then when I observe the depth of the thieving and cheating that goes on. Thanks as well for your encouragement. I’m glad to note that I have company when it comes to the “D” word. I’m even more delighted that you find the ‘decline in respect for the elderly’ intriguing. I hope one of these days you’ll find time to write something on this as you observe the youths of Barilan and/or the youths elsewhere in the Philippines. I have never been to Barilan. I was born and raised in Manila. The only places that I have been down south and had the chance to stay for a considerable length of time is in Cebu, Masbate and Davao and that was in the 1980s. Surely, things must have change since then. Also as you might have sensed, I left the Philippines in 2000 to immigrate and would normally visit Manila every other year. In April 2014 is my next schedule. I pray that you and all those who have been directly or indirectly affected by Yolanda will soon have normalcy. I know that for many, it may take longer than what one could wish for. At this point, I would like to take the opportunity to congratulate and thank your other followers. I find their comments very intellectually stimulating. Reading your blog and their comments is definitely a good way for me to ward off dementia. Opppss my apologies… I just noticed that I wrote “Barilan” instead of Biliran. My failing memory and eyesight are giving me away. Or perhaps the real culprit is my reading of the so many gun related killings in the Philippines lately. Ahahahaha, yes warding off dementia is top priority for (a) those with way too many years under the brain, and (b) living in the same country as the Binays. I agree, great insights and enrichment come from the many contributors. I might have to change the name to the Society of Insight and Integrity. Woohoo! This is really Christmas now, Joe is back! 🙂 They almost found me but I ducked into a thick stand of bamboo. Another of your delightful linguistic creations: “…overlapping government entities engaged in fighting battles of ego”. Simple English, but brimming with meaning. You have an eye for the gems, for sure. I liked that phrase, too. Right up there with “pushing plastic down the Pasig and into the Bay” . . . Cheers back. Great to have you back, Joe. And still with that characteristic problem-solving, proposal forwarding mindset, I see. Thank goodness that didn’t get swept away by Yolanda’s fury! Cyberspace can be such an angst ridden world without our Joe and his idea generating thinking hat. Here’s to a “powered-up” Christmas for you and the whole of Biliran! Glad you’re back! You REALLY need to improve you emergency comms capabilities. You had us all worried sick… Will now read your article and respond accordingly. Yes, and I was reading today that the officials trying to respond to the beaten-down Tacloban also had trouble communicating. The lackadaisical response of Smart and Globe has been amazing to behold in our area. I couldn’t even get word to my family in the US for a couple of weeks. My brother was climbing all over the Manila Embassy staff who apparently did not know where Biliran Island was. He went Pinatubo I think . . .
What is the environment like there regarding the exploration and use of alternative energy like wind turbines and solar panels? I guess you’ll have to have ones that you can dismount and re-install prior to and after a disaster but could be a real boon for emergency relief and rehab. There are solar powered generators in the market but I don’t know if they are available there. What’s your thought on the Meralco price hike and the resulting investigations and legal proceedings? Good old Maslov… Basic “physical” needs first, than “security” or guaranteeing basic need tomorrow a requisite for the next level “Social” needs. Addressing the food, shelter and heath needs are the subject of the emergency relief efforts. Recovery should start by providing means for people to support themselves. I fully agree with your analysis. A military style of emergency relieve, well organised, well prepared, well trained, semi-automatic deployment. Support people to help themselves start with supplying the things with maximum leverage, access or clear roads, communication, money, fuel. Put the responsibility where the capacity is and at the lowest possible level. At calamities people and organizations tend to be introvert. I a previous life I tended only to think our own plant, our own employees and how to help them, we forgot our social responsibility. Your idea to force companies to think extrovert is brilliant. It will require them to do risk management in a holistic way for a local society. Refreshing to have you sharing your ideas again and stimulate our thinking towards future improvements instead of just playing a blaming game. The thing that impressed me here on Biliran was the civility that was displayed under duress. Police for the most part kept a low profile, and that was a good thing. It was rather an expression of confidence in that civility. People just did the best they could and retreated to a lot of candle-light dinners in the evening. Probably be a nice flight of new babies in 8 months. My kid, rather than watching TV, learned to read. You are absolutely right about introvert/extrovert. Markets work if they have the essential resources, and when they work, people are comforted and they have means. The blackness of the unknown – our first week – is horrid. So true. I have unfollowed some friends and family because of too much negativity on Facebook. Welcome back Joe. We are glad you are safe. Many people also asking if you are on twitter, we need you there to counter the hatred. My blogs and comments get tweeted but I don’t hang out there and seldom read even those I follow. It is too fast-paced for my slow-paced gait. The twitter handle is @societyofhonor. I appreciate that you appreciate a hunt for ways to build strength. Living in the Gulf Coast, I am familiar with hurricanes. I guess we have a lot of practice here so we usually bounce easily from natural disasters. The local and national governments provide assistance but the real heroes are the local and national NGOs and volunteers who come to our aid. It is heartwarming to see how local entities such as Meals on Wheels, Red Cross, food banks, soup kitchens, churches, businesses, as well as local volunteers in cooperation with the local government (Local officials, Police, Sheriff, and Fire Departments) as first responders. In most cases, the national government does not deploy the military and FEMA immediately and the national volunteers do not arrive till after a few days of the devastation. The devastated locales are usually on their own for a few days, but the preparation and efficiency of the local government together with the overwhelming generosity of local organizations, businesses, and volunteers keep desperation at bay. I think the Philippines should have a detailed and comprehensive local and national disaster mitigation plan. It does not look good for the Philippines when the world sees the local and national government officials trading barbs and blames while people suffer. I think significent strides are being made, actually, with the new disaster laws but there are significent problems of ego from overlapping agencies and not enough “drive” from corporations providing crucial services. David Webb provides a nice viewpoint on that in his comment, below. Disasters like Yolanda remind me of the temporary nature of life on earth; earthly existence is fragile and dangerous. I personally don’t expect life on earth to be perfect– only in the afterlife as my faith says. On topic, you might want to check RA 10121 and see if your suggestion is consistent with the statutory law. 1. Scope of RA. – This Act provides for the development of policies and plans and the implementation of actions and measures pertaining to all aspects of disaster risk reduction and management, including…. EARLY RECOVERY– I think this is where your lifeline services could possible come in. Bottomline: RA 10121 isn’t adequate because under declaration of policy (e): Develop, promote, and implement a comprehensive National Disaster Risk Reduction and Management Plan (NDRRMP)…… It’s about formulating plan, not a “stick” legislation. My verdict: Another law, such as your suggestion, is needed which effectively MANDATES corporations to provide post-disaster service. We need a constitutional expert on this blog to make discussion more interesting. Agree. And thanks for looking at how the idea might fit into existing law. Good to have you back, Joe! Re: The Lifeline Services, Act – Totally agree with you. I wonder though – how will some local government officials take this kind of chain of command. Some of them (like the Binays) treat their cities as their own personal fiefdoms. For example, the MMDA has implemented a number coding scheme which Makati city does not recognize. Yes. A most interesting question. I think it would require a form of calamity martial law that would mandate jail for mayors etc who did not obey directives from higher authorities. Rather than argue with Tacloban’s mayor, Roxas would simply slap on a pair of handcuffs on him for insubordination. i join the horde in welcoming you back joe! whew the vacuum that you leave when you leave. even mariano and edgar lores et all are sorely missed. i can then resume my seat in the “joe am theatre” and enjoy the reparte . wishing you a blessed christmas ! Thanks Joy. Holiday best wishes to you. Joe, welcome back to the universe of internet and electricity. Merry Christmas to you and your family. Glad you are all safe. Totally agree with you. Natural calamities like typhoon happens a lot in the Philippines and knowing the character of Filipinos … Philippines should have an in place dictatorial military response to these. PLEASE FILIPINOS, JUST TO DISASTERS and DON’T GO BEYOND DISASTERS. Yap, all these private corporations should also have their responsibilities. Donate to the Filipino people and not to election of people who will advance their business interest. Good to be back for sure. Glad we agree on a “determined” approach to disasters. Merry Christmas to you! Just read RA 10121: http://www.lawphil.net/statutes/repacts/ra2010/ra_10121_2010.html . I think an amendment to Section 19 and 20 should take care of the corporate lack of compassion. The Lifeline Services could be added to Section 19 and the penalties could be spelled out in Section 20. What do you think? It’s great that someone else pays attention to the legal implications. I think a new RA, not just a mere amendment, is needed because it’s not simply integrating the lifeline services in the punishable acts. The law should essentially mandate. In addition, the lifeline should have a specific scope, definition of terms and declaration of policy. I see where you are going with lifeline services mandate. My suggestion involves the KISS method but I do agree that there is a very sound logic in a well defined and separate law. Legal minds will always find loopholes so the more detailed and comprehensive the law becomes, the less holes to contend with in the future. Merry Christmas and a Happy New Year to your family!! Best to you too Mel. White Christmas there? Have a great new year! I’m glad you and your family are well, Joe. Thank God. Thanks J. Here’s to an enriching 2014! Not quite Christmas here yet but it is over where you are, so: Merry Christmas, Joe and family! Best wishes Dee. Santa needed his GPS to locate us here in the dark (no elec yet). But he got here just fine. • FLOODING is possible in low lying areas and LANDSLIDES in mountainous areas. • The public and the disaster risk reduction and management council concerned are advised to MONITOR the weather condition and watch for the next advisory to be issued at 2:00 PM today. Happy Holidays to Joe, who needs to stay safe as well, and Society readers. Thanks for the advisory David. Best wishes as well to you. Consulting in the Philippines always gave me very mixed feelings. People learn fast and they show a lot of initial enthusiasm, they make good plans, but then they slip into no or poor implementation. Only pressure by “authority” can make things move, not logic or even obvious benefits. What a difference with workshops in Germany or France, there it is almost impossible to motivate people to do things differently, but once they are convinced and committed, you can go home, it will be implemented, they will remove all roadblocks, even resistance of a boss, all by themselves. EDSA and the removal of Marcos had no follow through. Removal of two more corrupt presidents, no follow through. Ampatuan massacre, no follow through. Chief justice removal, still enjoying his ill-gotten wealth, no follow through. Napoles plunder case waiting for follow through. Private public partnerships, lousy follow through. The list of potential break through projects waiting for implementation is endless. A nice pass is here more important than scoring a goal; publishing a scoop, rallying around a good idea is more important than recuperating stolen goods, jailing criminals, reducing poverty, mitigating disasters. Many lessons will be learned from Yolanda, many good ideas formulated, but then??? Shouldn’t the discussion be in 2014 on how to improve follow through, how to take risks and move things even before they have the official blessing, dully signed and published in the right format by the President and the Supreme Court and the Church and, and, and… ? Or was the Christmas cake too heavy with too much cream and is my mood still too heavy too? I understand the importance of what you’re saying. But those trapos know that most Filipinos will forget quickly; therefore, there’s no incentive for them to follow through. A benevolent dictator is also a pipe dream. Are most Filipinos self-destructive or just too lazy too act? On poor implementation, just look at “paper-smart” Roxas and DOTC’s Abaya. Do Filipinos struggle to apply what they learn in the classroom? Every concerned Filipino citizen should make mental, or better, written notes regarding the exposed evils of the politicians and bureaucrats. Media only helps when the issue is fresh. @Joseph and David, “Failure to follow through.” Well worth a blog. How does inertia become so prominent? A body in motion in the Philippines seems to come to a complete stop. A new physics. There must be friction somewhere and a part of it is probably expecting someone else to take care of it, “because it is too dangerous for me to make waves.” Missing is the peculiar kind of determination and discipline to achieve, and thus our internet service in Biliran is still mighty crappy, two months later. But happy new year anyway! You made me laugh so hard about your new physics theory. Have to wipe my face and clothing now. Note to self: do not drink while reading Joe’s blog. Here’s to hopes of a happy and prosperous new year to all Filipinos and Filipino-loving citizens of the world! May the Philippines be blessed to realize its dreams of being the next Asian Tiger. It’s really good to see that you’re back!!! Happy new year to you and your family Joe!!! Thanks, w. Happy 2014. Good to be back. And to you, Eric. Thanks. Nice to see your back. Anyway, I work for one of the companies you mentioned and i will be biased on what I will say but you need to hear our side as well. 1. Employees on the affected areas lost their homes/were affected as well and did not report for work, hence, we had to send people from different areas to fix the damage. We had to deal with lack of manpower as well as find out what happened to our employees. Priority was given to the most affected area (mainly Tacloban). 2. I attended a meeting of Senior Leaders in my company (I am not a senior leader, I was there to provide information on the new system being deployed). Anyway, I heard that our employees were working 24/7 to fix the damage and that our leaders take it seriously. 3. We had foregone our Xmas parties and donated instead. We also have personally donated money, and worked for a couple of days repacking goods in relief centers. Thanks for the important reality check, JM. I knew I was on thin ice on cell technology. I still draw on the military anology. It is war and recovery would be better if MORE than ordinary 24/7 steps were taken to “find a way.” And it would be good to understand exactly why it took 2 months to get internet back up. Still no 3g here like we had before. Joe, as you must’ve noticed, i’m trying to catch up with “classmates” in your blog. I see my military analogy has been discussed by you and many. I am leap-frogging to federalizing the Philippines with Edgar n you. I found there is a blogspot on this subject too. I guess there’s both nothing and everything new under the Philippine sun. After spending decades in both PH & US, I’m still nowhere. I am still Robinson Crusoe shaking off my personal wreckage. Yikes! Ha, well I’m glad you are going through past writings. There indeed is good discussion there. I sometimes find myself writing what I wrote a year or two ago, with just a different slant. The issues stay here, and just emerge anew. However, I have not written about federalizing the Philippines, so that is whole new territory. I shall work on that I think.